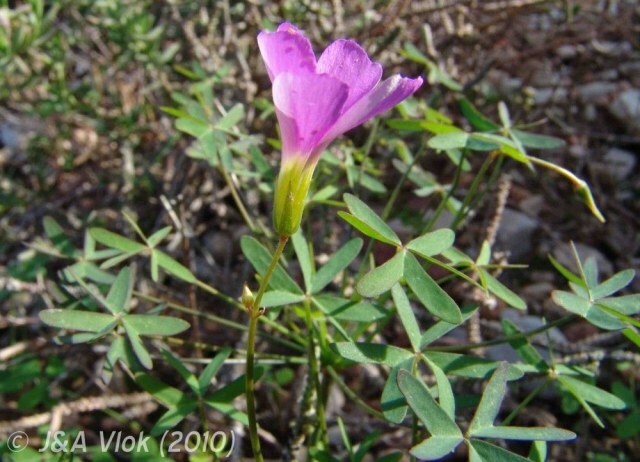 There are more than 200 species of Oxalis in South Africa and 270 varieties and probably many new species as well. The only handbook on the Southern African species, by Salter, is almost sixty years old and out of print so there are many challenges in identifying them. Cape Plants, a conspectus of the Cape flora of South Africa by Peter Goldblatt and John Manning lists 118 in the Cape Floral Kingdom but there is only a brief botanical description, location sometimes with habitat information, and time of bloom in this book. South African species D-E are found on this wiki page. 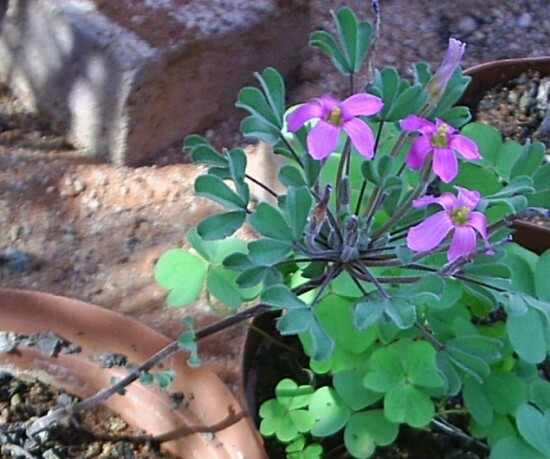 Oxalis densa N.E. Br. is as the name implies a dense tuft of leaves. The leaves are on short petioles, hairy. Found in rocky places around Calvinia and Williston. Photos by Christiaan van Schalkwyk. 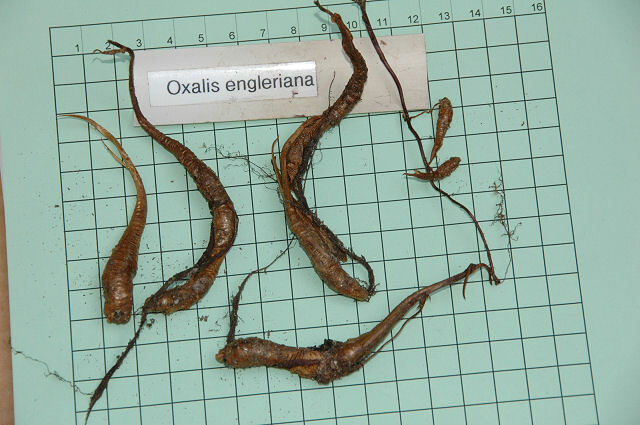 Oxalis densa MV4991 was collected by Michael Vassar, who rated it highly. His collection notes: "Farm Vanrhynshoek, level area between house and 1st gate in light brown sand. 1.1 inch diameter white flowers streaked reddish on half of the petal reverse. There is an articulation 1/2 inch up from petiole base but could find no bracts. Tiny, deeply lobed leaves less than 1/4 inch in diameter on 1 stems. Tufted plants to 1 1/2 inches tall with very obvious silvery hairs on all stems and leaves. Tunics very loose and papery, long and narrow." 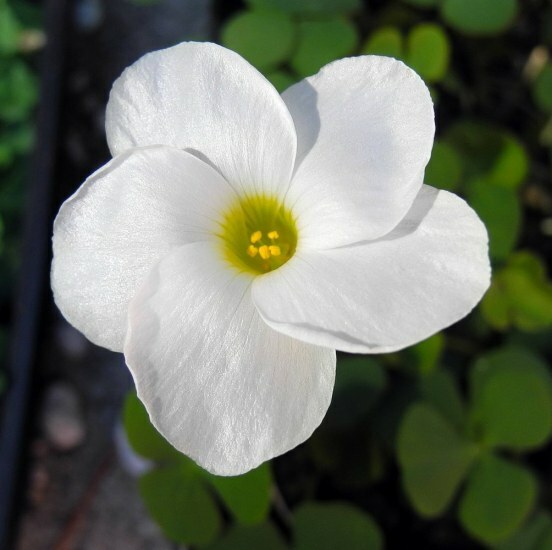 In cultivation, this selection produces a small, tight mound of silvery hairy leaves, topped with white flowers that are quite large compared to the plant. 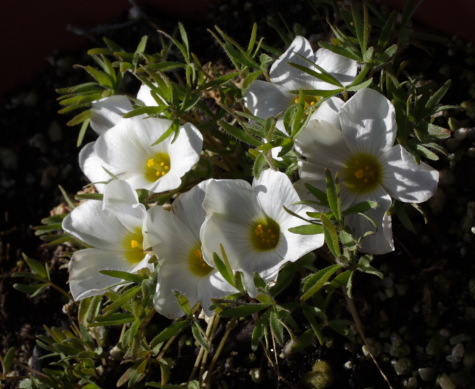 At first glance it looks like a delicate alpine cushion plant, but it is vigorous and easy to grow in California. Very rewarding. Blooms in mid-winter. 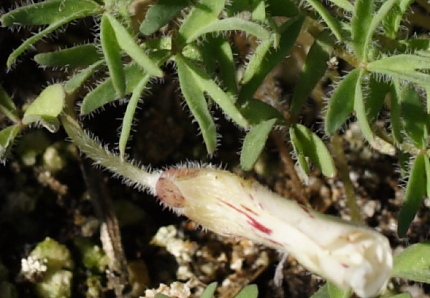 The first two photos show the plant, while the closeup shows the hairs on the leaves and flower base. 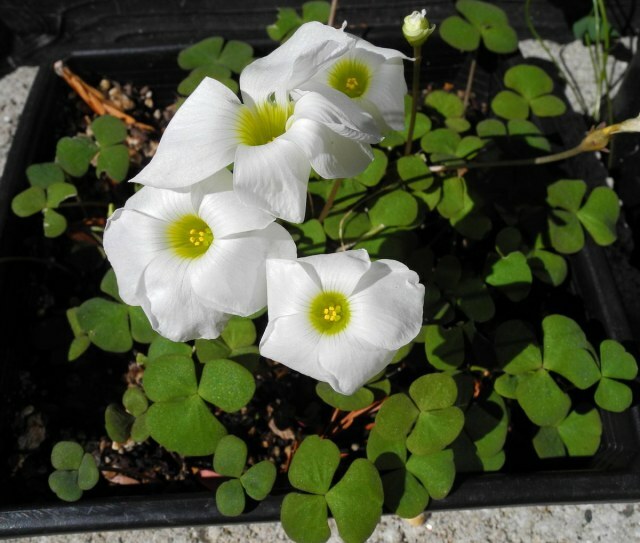 Photos and video by Michael Mace, who calls this his favorite Oxalis. 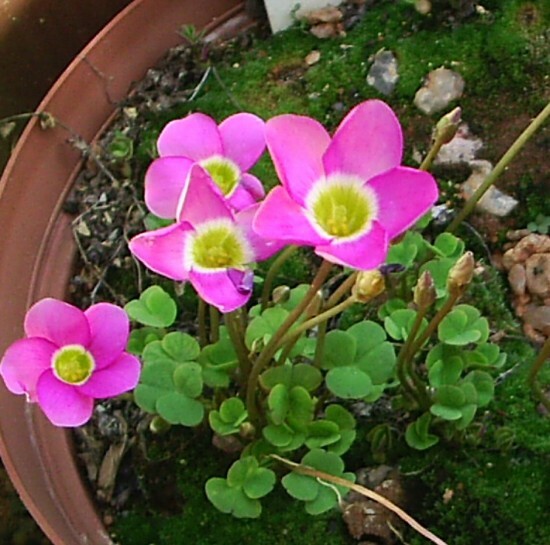 Oxalis dentata Jacq. has a stem and pale lilac flowers borne on an umbel. Often the flowers appear before the leaves. Some of the plants distributed under this name are obviously not this species. 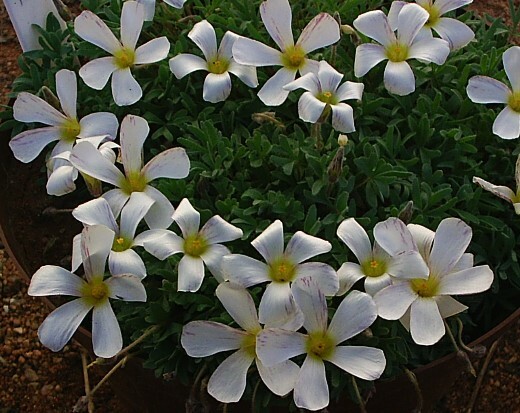 I have received such bulbs which are actually Oxalis uliginosa. 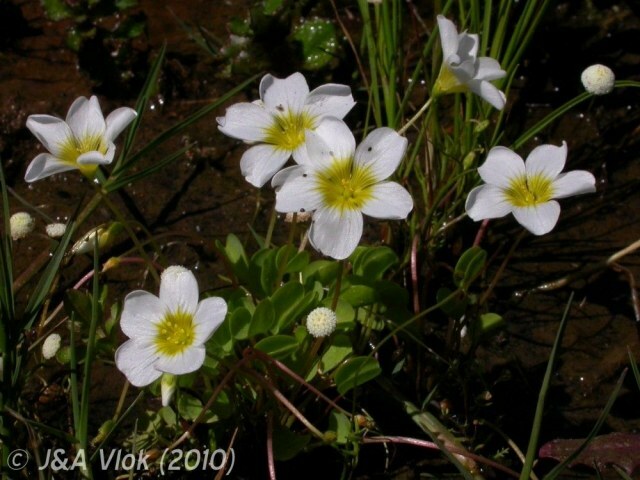 According to the South African Biodiversity Institute the name Oxalis dentata is no longer valid; this species has been sunk under Oxalis livida var altior. 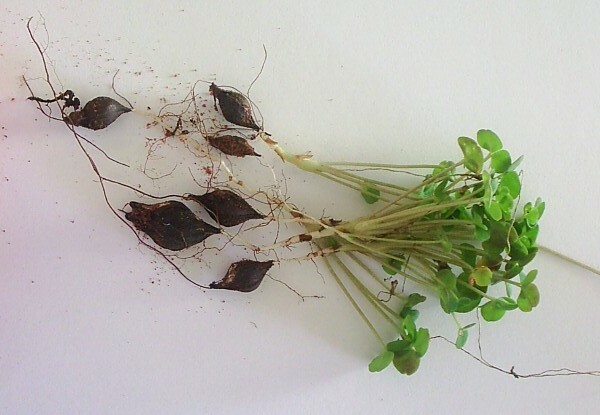 Oxalis depressa Eckl. & Zeyh. 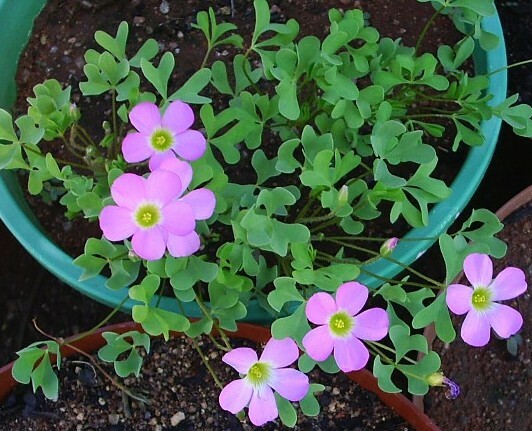 has succulent trifoliolate leaves and white, lilac or pink flowers with a yellow tube. It is found in a broad range of the Cape Province to Zimbabwe and blooms in the fall. Oxalis depressa MV4871 was collected 2 km inland from mouth of Kleine Brak River where it was growing in dry sand along the dunes and vleis. 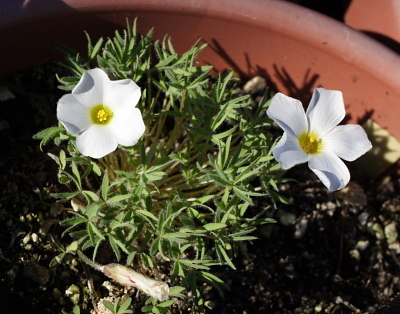 It has large white flowers and blooms for a long time for me in Northern California (starting in September to October and lasting often until December). Photos by Mary Sue Ittner. The last shows the bulbs on a 1 cm grid. 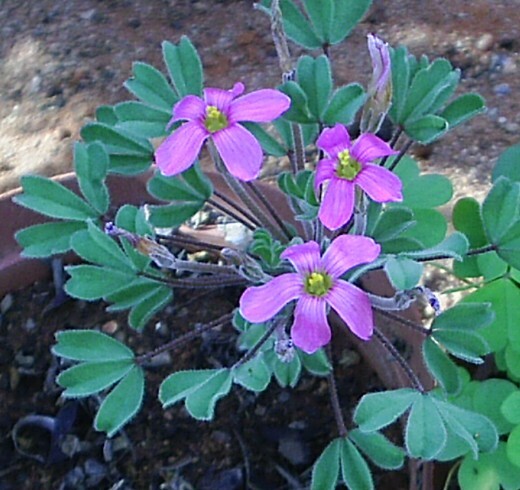 Oxalis depressa from Carnarvon. Photos by Christiaan van Schalkwyk. 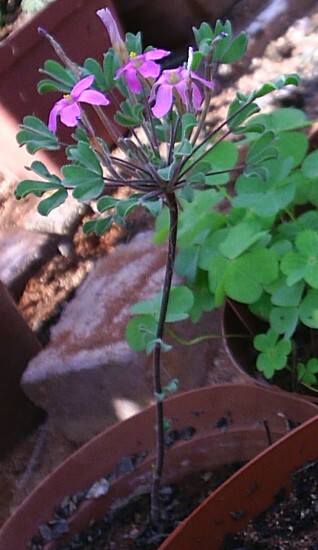 Oxalis dichotoma T.M.Salter is found in arid areas of the Little Karoo. Growing to 15 cm, this species has a beaked bulb, trifoliolate leaves with leaflets bilobed to the middle and 2 to 9 lilac flowers per stalk. It flowers March to April. Photo from the book Plants of the Klein Karoo courtesy of Jan and Anne Lise Schutte-Vlok. 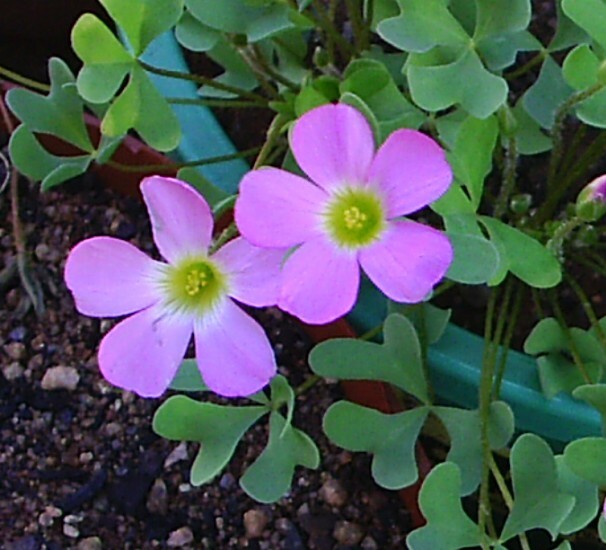 Oxalis dregei Sond. 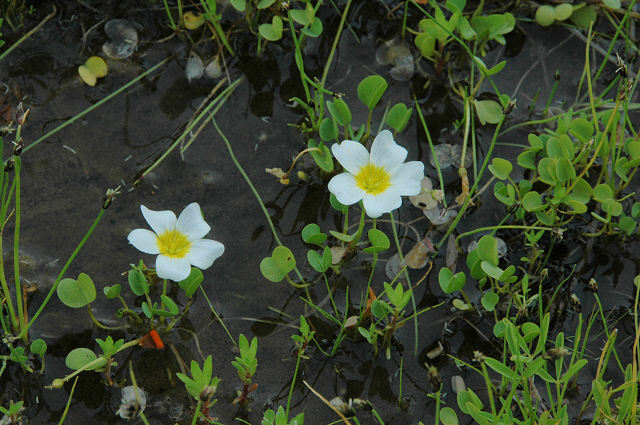 is a small marsh plant that grows to 5 cm with a small (less than 1 cm) bulb. 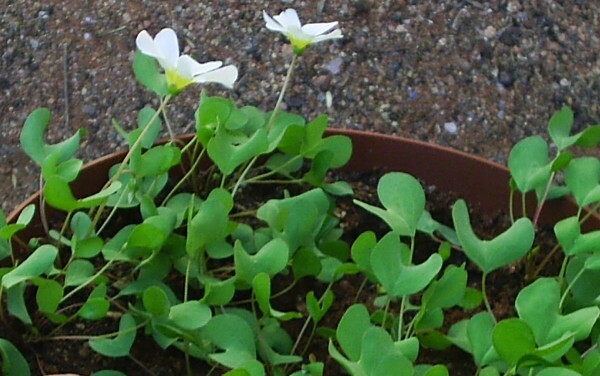 It has one kidney shaped leaflet and one white flower with a yellow throat per stalk. 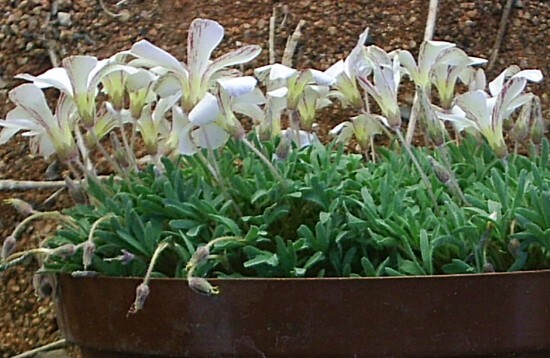 It flowers late winter to spring and occurs from Namaqualand to Worcester where it can be abundant in wet sandy soils. The first photo was taken by Christiaan van Schalkwyk. 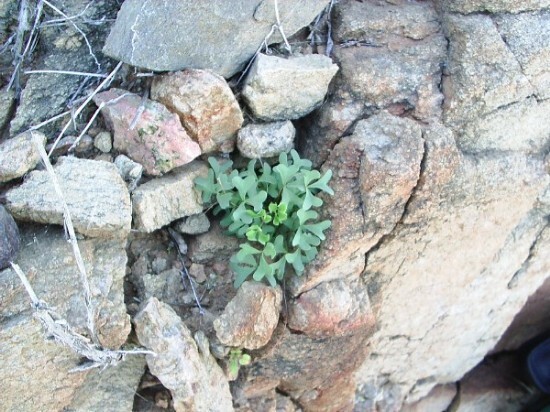 The second photo was taken by Bob Rutemoeller in Namaqualand September 2006. The last two photos from the book Plants of the Klein Karoo courtesy of Jan and Anne Lise Schutte-Vlok. 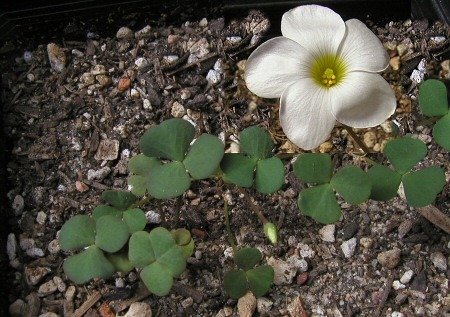 Oxalis engleriana Schltr. grows on shady southern slopes in the Northwest and Southwest Cape. It blooms in the fall and has 5-8 linear to linear-oblong leaflets and a rose or violet flower 3 to 4 cm with a narrow yellow tube. Photos by Mary Sue Ittner. 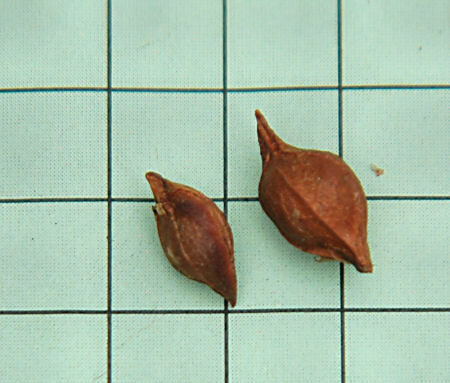 The last picture from Bob Rutemoeller shows the bulbs on a 1 cm grid. 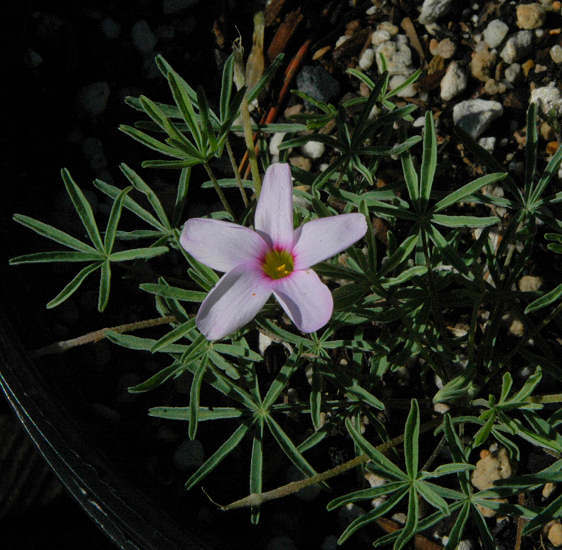 Oxalis exserta Salter is another Namaqualand species. This species always have a stem (caulescent) with the majority of the leaves at the tip. According to Salter it flowers sparingly; either I’m lucky or I have a particular floriferous clone. 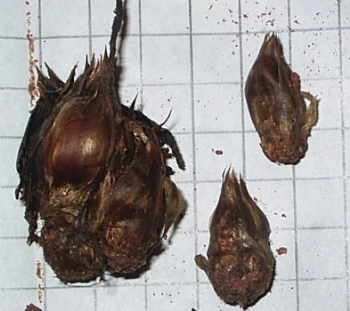 The bulbs have thin brown tunics and are shown here on a 1 cm square grid. Photos by Christiaan van Schalkwyk. 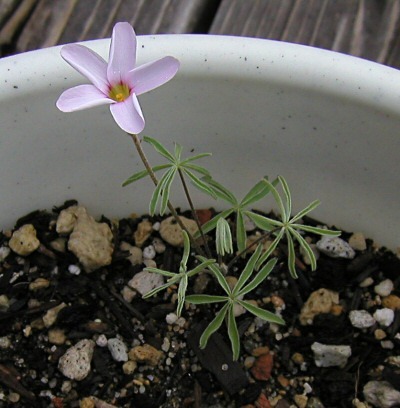 Oxalis extensa Salter is a small species with flowers in various shades of pink. Quite attractive, it is found in large masses on koppies, hills and other protrudences in the regions of Kakamas and Augrabies. This means it is not a winter rainfall species, and it seems to grow best if watered from late spring/early summer well into autumn. 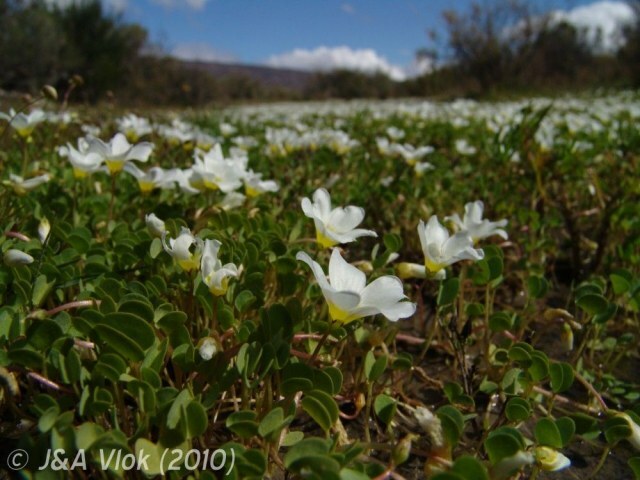 The third picture is from a plant in habitat near Kakamas. Photos by Christiaan van Schalkwyk.